Hi. If you read the rules, and comments by other moderator, you’ll hopefully appreciate that us mods are not employed by gearbox. Directing your anger at us will do nothing to influence future decisions by gearbox. Please, go and read those rules now. Please specifically note that being annoyed doesn’t mean you get to ignore the rules. Also, question to anyone who has played enough; Apparently there was supposed to be Map fixes/optimization or something? It was one of the major points at the last PAX when talking about the patch, so, has anybody noticed which map(s) were optimized and how? I spent all day yesterday downloading the patch with my sub-par internet, so I haven’t had time to explore much. Don’t remember if it was mentioned in the patch notes either. has anybody noticed which map(s) were optimized and how? I don’t play both nearly enough (haven’t found a single game in Supercharge), so I didn’t even notice issues. Figures that maps that weren’t being played got fixes. Hilarity continues, then. Guess only thing for me to see is how each individual character’s damage scaling changed their overall damage potential. I guess i should mention the update brought on some problems for me. i can no longer play in ‘borderless windowed’ as the game stutters incessantly. Hey Natsu! Would you mind submitting a ticket at support.gearboxsoftware.com? That probably shouldn’t be happening ;P! Figures that maps that weren’t being played got fixes. I finally finished the first episodeI am getting a knack for pulling off little combos with Melka… they’re pretty fun. Which thread should I revive for questions about her, or should I start a new one? It’s more about how loot works in this game, the little treasure boxes all over, crystals, and all that. I got my first set of gear (I think), and I don’t know what do do with it, and I just picked up a bunch of things… I don’t even know where to find or use them. I got my first set of gear (I think), and I don’t know what do do with it, and I just picked up a bunch of things… I don’t even know where to find or use them. In the lobby screen go to the Command menu and the Gear tab, there you’ll find all the loot you gather on your PvE adventures. Drag and drop them into one of the three slots on the left side of the screen to make a gear loadout which you can carry into both PvP and PvE. These items are activated with the shards you collect. Pay attention to the properties of the items, as some have negative effects (in red) that can either help or hinder your character. Ok, I found the gear, and after pawing at it for a few minutes, figured out how that there are different gear types (not how to rotate it out yet). I went through the same thing with the Destiny Beta… didn’t even know I had a skill tree for like half an hour, but it took another 30 min to figure out how to navigate it. I swear I’m not an idiot. How many gear types are there, and what are their, eh, classifications? I’m gonna paw at this some more until I figure out how to move stuff around. edit - wait, can you buy more loadout spots? I was going to wait a while to ask about the credit system, but maybe now’s a good time. This site is your best friend! Note the maps tab - extremely useful for the Story Ops if you have those and want all the loots. Edit: Ninja’d by @beya because I was too busy typing extra information. Must. Be. Concise! 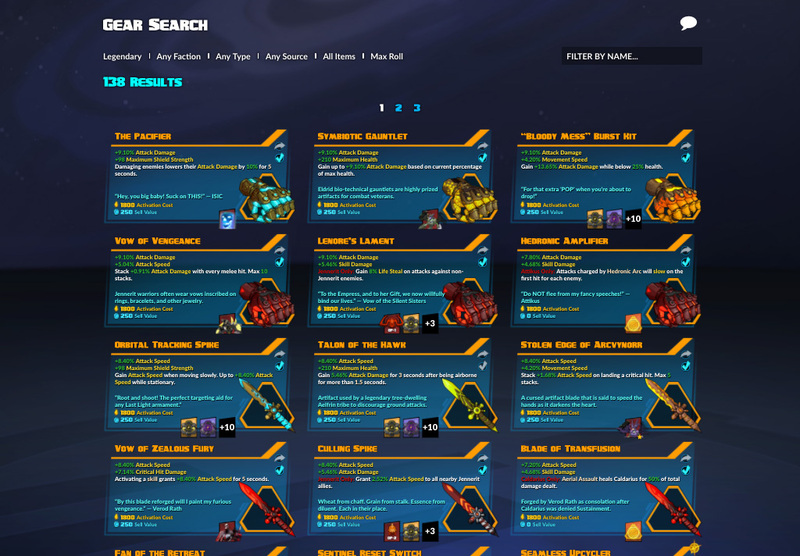 I think it’s easier to create a new thread in Battleborn General Discussion. This game has tons of details you can discuss like forever. But while you’re in PVE you don’t need to worry much about learning them as fast as possible. Shoot stuff, have fun. Might be worth trying to get a group together and seeing if some people can talk you through as you go - plus it’s probably more fun that way. Do we have any volunteers? I believe it’s PC players we’re looking for. Worst case scenario we get a load together for bots or private pvp. I’m not sure how keen a group would be on holding my hand for an hour while I fiddle around with the UI trying to figure out what the gear descriptions mean and other stuff. What’s CC stand for? (Seriously - noob level here is over 9000). That site is a little overwhelming at the moment, though I did figure out (I think) that the color scheme for rarity matches BL2 (though I’m not yet sure that rarity means the gear is better). I’m not sure how keen a group would be on holding my hand for an hour while I fiddle around with the UI trying to figure out what the gear descriptions mean and other stuff. though I did figure out (I think) that the color scheme for rarity matches BL2 (though I’m not yet sure that rarity means the gear is better). Somewhat, PvP it’s a lot more down to cost vs gain. PvE it’s whatever gear you like and find works for you mostly. @Adabiviak , you’re on the CaH discord right? Just pop in whenever and ask questions or see whoever’s around for a match. Finding groups is hard enough these days as it is.